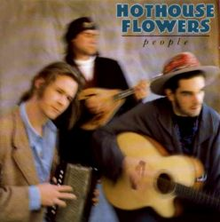 People is the debut album by celtic rock group Hothouse Flowers, released in 1988. This album to date is the biggest selling debut album by an Irish artist in Ireland. All tracks written by Liam Ó Maonlaí, Fiachna Ó Braonáin and Peter O' Toole, except where noted. ^ People at AllMusic. Retrieved 6 December 2010.